Yes! finally on of my favourite brand new has its makeup range. I am sure most of you know about Sulwhasoo, the leading luxury holistic beauty brand from Korea. The brand debuts its highly anticipated range of makeup celebrating ‘natural beauty with a tinge of colour’ recently. 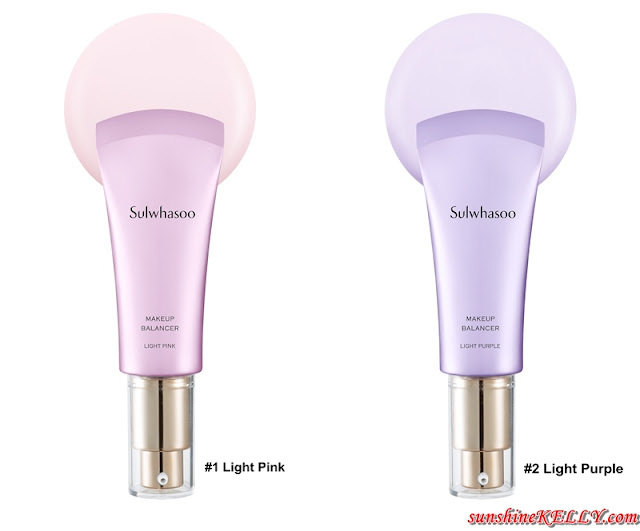 Sulwhasoo K-Beauty Collection of Makeup is inspired by the dewy glow and natural radiance that is a hugely popular beauty trend from Korea that has become a global phenomenon. As we can see, women around the world are gravitating towards K-Beauty look aka the ‘no-makeup makeup look’, appreciating natural flawless skin and wanting to achieve radiant vitality. Makeup Balancer – a base that offers medium coverage and helps to rebalance the skin into a healthy state. Essential Concealer Stick – a smooth, creamy texture that effectively camouflages blemishes and age spots. Radiance Blusher – adding a natural radiance and glow to the cheeks. Essential Lip Serum – achieve healthy, hydrated lips with a light pop of colour. The Signature Perfecting Cushion and Perfecting Cushion Brightening – this is so precious and a must have cushion foundation. It’s now available in additional new shades to cater to a wider array of skin tones. Sulwhasoo introduces the new Makeup Balancer, a third generation makeup base. It gently balances the power of skin, moisture content, skin tone, creates a healthy foundation of the skin and skin irregularities during the early stages of aging. It acts as antioxidant to the skin reverses the signs of aging on dull skin and brings it back to its original, healthy state. Improves skin tone, texture and restores the balance between skin hydration and moisture. Usage: Apply Makeup Balancer as the first step before foundation to create a perfect base for your skin. #1 Light Pink - Contains pomegranate extracts. It helps to create a pinkish radiance to your skin, suitable for all skin colours. #2 Light Purple - Contains peony extracts, helps to correct dull and yellow skin tone. Now you can erase skin imperfections with this Sulwhasoo Essential Concealer Stick, just a single thin even layer and quick, leaving flawlessly smooth skin. The soft spheres of the cover powder spread smoothly over the skin, easily covering blemishes and uneven skin tone. It creates a thin, buildable layers, and leaves a sleek appearance that will not feel heavy nor cakey. #2 Medium Beige for covering the redness on your cheeks or reddening blemishes. Glide the Essential Concealer Stick over blemishes and areas where coverage is needed. Gently pat the Perfecting Cushion or Perfecting Cushion Brightening over the remaining areas of the face, leaving a smooth, even skin tone. If you want a more flawless coverage, apply concealer for pinpoint coverage as a final step. Omg! this is so so pretty, look at the colors and imprint. Sulwhasoo Radiance Blusher is a multi-colour blusher with a brush inside that adds the brightness of vitality and a radiant skin tone to the cheeks to breathe in liveliness to your skin. Sulwhasoo Radiance Blusher contains three shades: main blusher to give skin exquisite radiance, darker pink to control shade intensity and the light pink shade for highlighting effect. Radiance Blusher uses Bloominous Pearl Powder, which reflects a tint of red and light to make the skin feel fresh and radiant in a beautiful bloom, like red plum blossom. Sulwhasoo’s luxurious brush with softness and resilience helps with easy application. Step 1: Use a brush to blend all colours of powder and sweep toward the centre of face from the outer part of the cheekbones 2-3 times. Step 2: If you want to look livelier, blend around the darker flower part to apply once more on the depress part under the cheekbones. Step 3: To add definition to the face, use the side of the brush and glide on the highlighter, gently sweep over the forehead, the bridge of nose, under-eye area, and chin area. Sulwhasoo Essential Lip Serum Stick is a tinted lip balm with a rich texture that glides on the lips to moisturize, nourish and plump up the lips. A moisture-boosting lip serum brings dull lips to life. Apply the product vertically to fill in the wrinkles – reapply as needed. The Perfecting Cushion Brightening with sunscreen SPF 50 PA+++is a must have and perfect for summer to protect the skin against UV rays, giving it a non-stick, lightweight and soft matte finish. It gives medium coverage with an instant brightening and glowing effect. It also uses the Oil Capture System, which is effective in capturing and absorbing unnecessary oil, to give a smooth skin-fitting finish without leaving a sticky feeling. It’s perfect for summer to protect the skin against UV rays, giving it a non-stick, lightweight and soft matte finish. The Perfecting Cushion is an all-in-one cushion compact which has sunscreen SPF 50 PA+++ and multiple skincare benefits. It delivers long lasting hydration, improves skin elasticity, and promises healthy glow and revitalizing radiance. The watercolor technology provides perfect coverage while reducing lines, wrinkles and spots. The Flexible film-fixing polymer Technology forms a thin protective barrier on the skin to leave the skin flawless and smooth for up to 12 hours. Sulwhasoo K-Beauty Collection of Makeup is now available at Sulwhasoo counter at Parkson Pavilion 03-21106218; Parkson Gurney 04-2288521; Parkson 1 Utama 03-77319646 and Parkson KLCC. The packaging looks elegant and beautiful! What is the main difference of lip serum and lip balm? Can the lip serum also be worn on beneath the lipstick? These beauty range is best for women all over the world. Really great for them to use everyday. Well, lovely products indeed! Whoa!!! Looks like one heck of a product range. You should do a review with FOTD & swatches. I dunno how can these couple of colors as foundational & concealer match all skin tones. Wow! Hope Sulwhasoo have an outlet here in the Philippines, especially in Davao City. I love all their makeup. Hope I can have a try. They have a great pop in their colors. Definitely, in a girls wish list. This is a great product, but I think it will be a perfect and match for ladies. I don't really use make-up like this but you can't deny how nice the packaging is! It sounds like an awesome product and I'm sure a lot of ladies will like it. So good-looking set of products! I feel like trying out the range right away. Now this makeup collection is a perfect to have indeed. With a high SPF, sure that many would definitely like to have this. Sulwhasoo is an established brand which has their own followers. It will be nice to try out these cosmetics when I visit their stall. I want to try the Lip Serum stick! I like to do make only with branded cosmetics and I will surely try Sulwhasoo brand. I have not heard of this brand before but I really know nothing about make-up. I do not use these sort of products, but this product line looks promising and those make-up containers are just too lovely.